The UK has more cocaine users than any other European country, according to the UN's latest report on drugs. More than one million people regularly use the Class A drug in the UK - although Spain has more users per head. The World Drug Report for 2009 said purity levels were falling and prices rising, leading to a stabilisation or decline in use. The UN Office On Drugs and Crime said there was clear evidence that cannabis use was falling in the UK. In its annual review of the trade, the United Nations office on Drugs and Crime (UNODC) said there were an estimated 860,000 cocaine users in England and Wales and a further 140,000 in Northern Ireland and Scotland combined. It said: "The UK thus continues to be - in absolute numbers - Europe's largest cocaine market, with its second highest cocaine use prevalence rate." The report said that the price of cocaine had been rising thanks to law enforcement agencies taking greater action against traffickers. 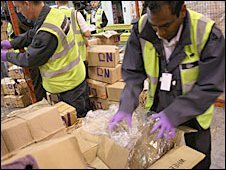 In turn, the UNODC said British customs officials had seen the purity of cocaine seized fall from 67% in 2007 to 56% in the first three months of 2009. British police have told the UN that almost a third of their street seizures now had purity of less than 9%. In some cases purity had fallen to as low as 5%. "The increased dilution of cocaine within the UK also suggests the establishment of large international trafficking activities in cutting agents which are usually legal substances when they are not used to adulterate cocaine. "The Serious Organized Crime Agency (SOCA) seized some 15 tonnes of such cutting agents over the last year, which is more than the amount of cocaine seizures. "The cocaine wholesale prices rose over the same period from some £30,000 per kg in 2007 to £45,000 per kg in the first quarter of 2009." The report found that there was now a "clear downward trend", in the use of cannabis among young people in the UK. It found that in the year to April 2008, just over 7% of the population had used cannabis, down from almost 11% in 2002-03. Overall, the report said that global demand for cocaine, opiates and cannabis was declining - but production and use of synthetic drugs is up. There are the "first signs" of the cocaine market stabilising in some parts of western Europe. While cocaine use in the UK has consistently risen since the mid-1990, the latest figures for 2008 showed a slight drop in users. Some 2.6% of people in England and Wales aged between 16 and 59 used cocaine in 2007 - a figure that fell to 2.3% the following year. Responding to the report, Home Office Minister Alan Campbell said: "The latest data from the British Crime Survey is encouraging and suggests that cocaine use amongst adults in the UK is starting to fall after remaining stable for several years. "We are however not complacent; we are taking comprehensive action to tackle cocaine use from increased enforcement to reduce the supply, along with effective treatment, education and early intervention for those most at risk. Evidence suggests our approach is working."